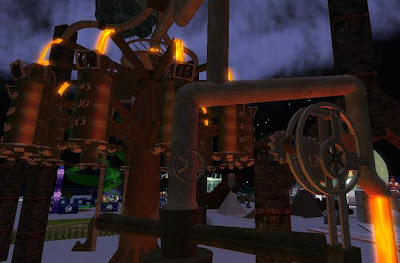 Went to see Elfod Nemeth's fantastic Burning Life exhibit last night, a magical mystery lava clock with a tricksy striking of the hour which happens...well, on the hour of course. Once it rezzes it's a striking build... as I discovered, it looks brilliant at midnight, too. It's a shame that Burning Life produces a lot of clutter in the background, but you can see what I mean in the shot above. The lava effect is one of the best I have seen in SL, and it's well scripted, the idea being that the cylinders for the hour fill with lava over the course of the hour. Thus cylinders 1-4 fill to produce an effect at 4 o'clock, and cylinders 1-6 fill to produce an effect at 6 o'clock. Shan't say any more - you really need to go see it for yourself. SLURL: Burning Life (Babel) 15, 163, 24.